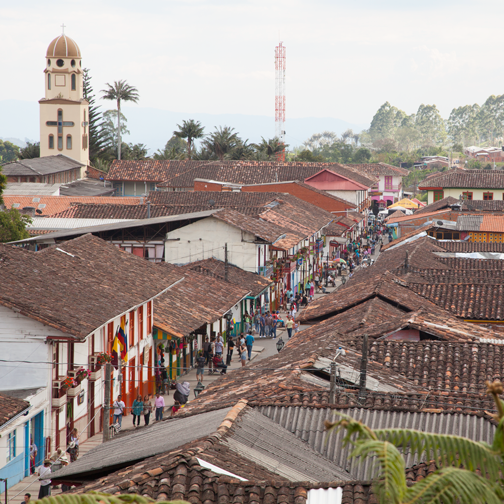 Colombia has a lot of three-day weekends. They are called puentes, which means bridges, and when my first one came up I leapt at the opportunity to get out of town. So early Saturday morning Barret was squished in the back of a small buseta while I sat next to a woman in a blue cardigan and torn jeans. Ten minutes into the trip she pulled out a multi-colored rosary and began crossing herself every time we passed a church, went over a bridge, or stopped at a tollbooth. She got off at a bus station in Pereira and on the way out of the parking lot I noticed a glass display case with the Virgin Mary holding a baby Jesus. It made me wonder who decided that was the right pose for a bus station statue. 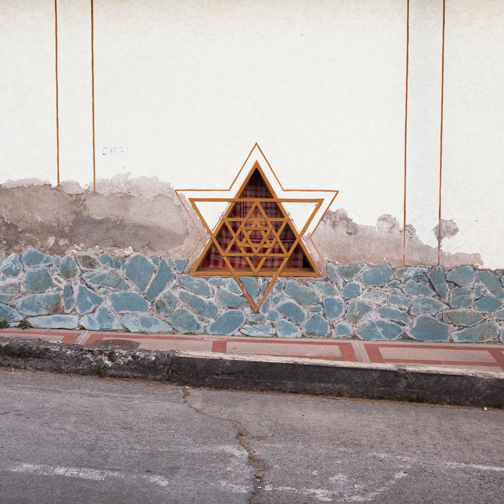 It was mid-afternoon when Barret and I arrived in Salento. We ate at a restaurant overlooking the most popular and photographic street in the city- Carrera 6. Only after our stomachs were full did we start the search for accommodation. The first guesthouse we visited was on the outskirts of town. The garden was filled with toys and sunflowers and the foyer was actually a living room with an overstuffed couch. It was an odd juxtaposition of private versus public. The place was completely booked though, and the only thing they could offer was a tent on the porch with a thick sleeping pad and some blankets. Barret and I declined, but after a disparaging walk around the city, we quickly realized that the tent was our only option. If there is anything I have learned from traveling on a puente weekend, it’s that reservations are imperative. We spent the first half of the evening watching a very untalented caricature artist and the second half in a small cafe listening to excellent live music. We weren’t in a rush to make it back to the tent, but when we eventually did, we slept well. The only exception being the return of a group of drunk Colombian tourists. Upon seeing a row of tents on the patio, one of the guys yelled out. Look at those gringos! What are they thinking?! The following morning Barret and I woke up very early to begin our hike to Valle de Cocora. From the main square in Salento, we caught a jeep to the trailhead. There was an option to hire horses, but Barret and I decided to walk the whole circuitous route. 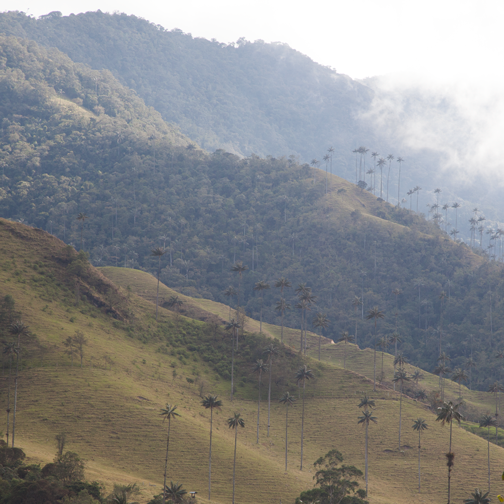 Valle de Cocora is famous for its sweeping views of the wax palms- Colombia’s national tree. This is in no small part thanks to the herds of grazing cattle that nibble all the vegetation around the wax palms. The trees are already slender and insanely tall, but when viewed unobstructed, they are even more impressive. 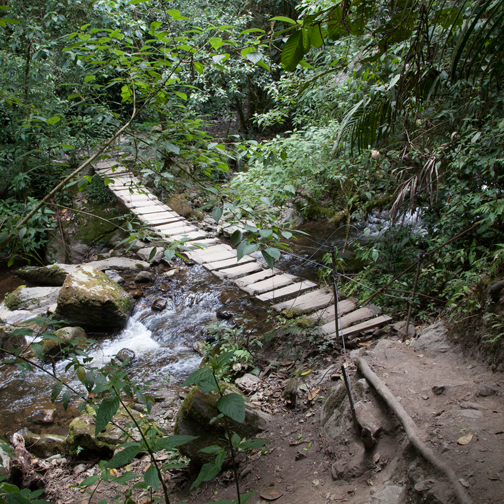 Several hours into the hike we stopped at the Aicame Natural Reserve. 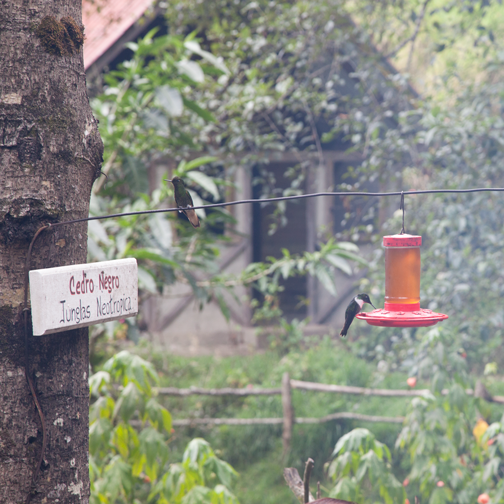 It was a small hummingbird sanctuary located at the end of a seemingly never-ending ascent. There was a fee to enter the reserve, but it included a beverage. We also discovered that the reserve had a very basic but insanely cheap lodge. Beds were available for something like 10,000 pesos (USD$5) and the cost included food! We weren’t prepared to rough it another night, so after viewing all the hummingbirds we double-backed and continued walking the full circuit. 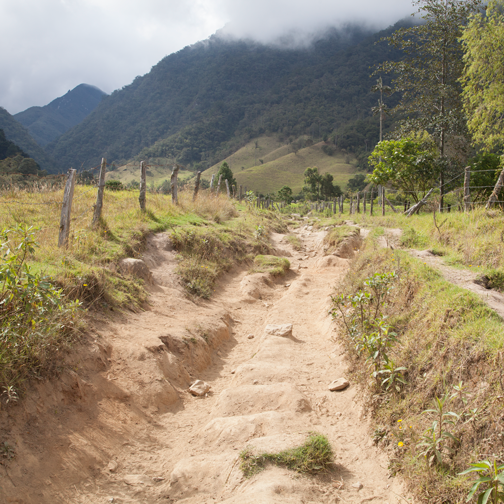 An hour or so later the trail came to a head at a lookout point named Finca La Montaña. The lookout point had a flower garden and a small building with a covered porch. 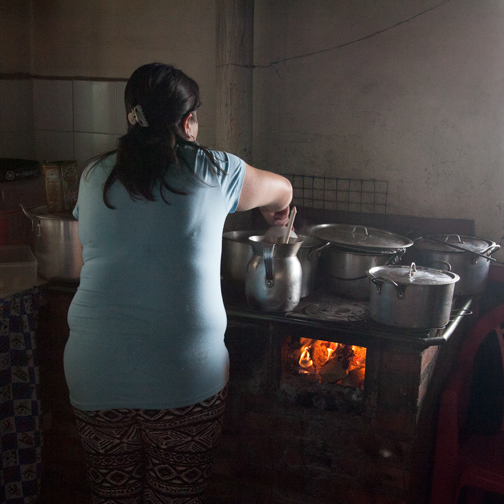 An open door led from the porch into a small dark kitchen where a woman was making traditional Colombian hot chocolate over a wood-burning stove. In its raw form, the chocolate comes in hard blocks that are dissolved inside a metal jug. 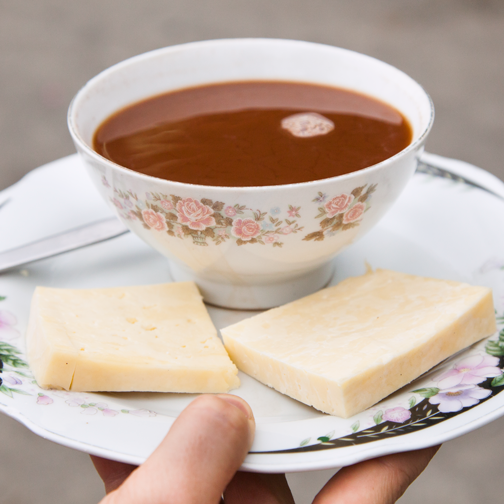 Once prepared, the hot chocolate is served with a thick slice of queso campesino (a soft, spongy, and slightly salty cheese). I was initially reluctant to drop cheese into my hot chocolate, but it actually tasted delicious. The cheese softened and the saltiness balanced well against the sweetness of the chocolate. I felt like that was a good metaphor for the weekend- the salty frustration of lugging our backpacks around town in search of a room was tempered by the charm of the city and the beauty of the valley. Having the one makes you appreciate the other so much more. 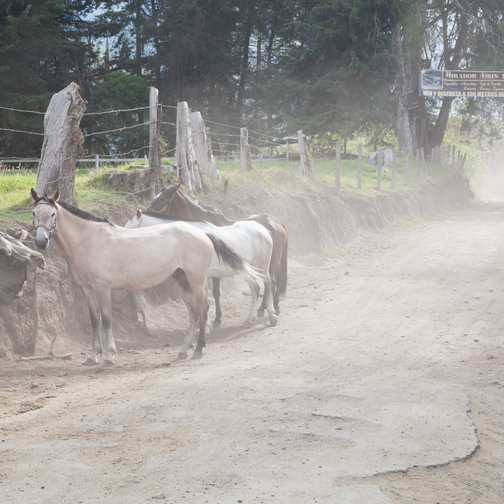 How to get to Salento: Direct buses are available from the bus stations in Armenia and Pereira.